Plastic is a kind of polymer with a high molecular weight. Because of its characteristics of light weight, high durability, malleability and low production cost, it has been widely applied in our everyday lives. Although it is very convenient to use, it fails to degrade naturally even after hundreds of years and as such causes tremendous problems for landfill sites. Furthermore, the combustion of plastic generates toxic substances. When plastic rubbish gets into the oceans, it can be carried by the ocean currents and ends up forming sea garbage gyres which threaten the marine ecosystem to a large extent. This exhibition combines elements of science and art. A large centrepiece comprising plastic flotsam collected from the beach cleaning operations in the North Sea, Hawaii, the Baltic Sea and the rest of the world is displayed with the aim of arousing public awareness of plastic waste. In addition, the exhibition also makes use of different video footage and interactive exhibits featuring unique designs. 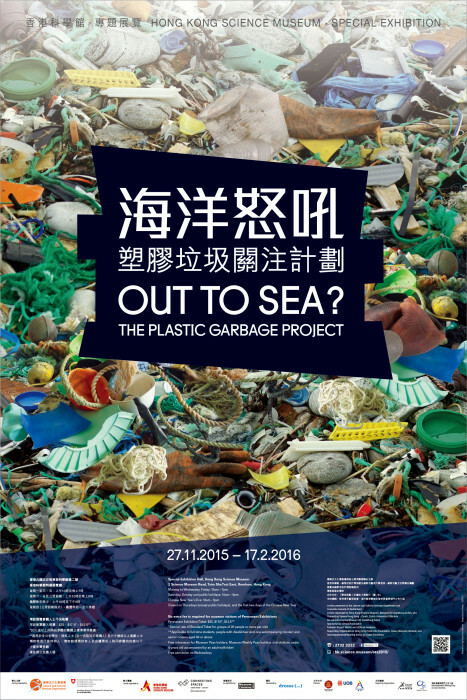 Through the exhibition, visitors can gain an in-depth understanding of the chemical composition, classification and recycling processes of different plastic materials, and also learn about the harmful effects of plastic waste on birds and marine animals. The aim is to let us realise that we must curtail our consumption of plastic and encourage the recycling of plastic immediately. To enrich the educational experience of the exhibition, we have specially invited the students of the “Project WeCan” to collect plastic garbage from the beach, classify them, and make different works of art using plastic garbage for display in the exhibition.